Publisher/Date: First Second, an imprint of Roaring Brook Press, a division of Holtzbrinck Publishing Holdings Limited Partnership, c2017. Tillie Walden’s graphic memoir recalls her years of competitive figure skating. Starting when she was five, the sport had been her only focus, monopolizing her time outside of school and dictating who she was close with during her childhood. While we don’t see many details about her early years, we get the impression that they were joyful. When she finished fifth grade her family moves from New Jersey to Texas. After that move, her parents were less involved in the sport then she was, often making her feel alone. “Skating changed when I came to Texas. It wasn’t strict or beautiful or energizing anymore. Now it just felt dull and exhausting. I couldn’t understand why I should keep skating after it lost all its shine.” (139) She relied on the small acts of friendship and camaraderie in her teammates, and even found forbidden romance. But when that abruptly ended and her art pursuits bring the joy and feelings of accomplishments that she was no longer feeling with ice skating, she quit without looking back before starting her senior year of high school. It’s a story of trying to find your place in the world. Tillie is struggling throughout the novel with her identity of an ice skater being the only way she and others see herself. Latching on in turn to her first girlfriend, her coaches, and fellow skaters, she’s looking for the support and attention that skating previously provided her before moving. The slow unspooling of the years of early practices, taxing competitions, and disconnectedness with her fellow skaters begin to take their toll, and readers can empathize in those feelings that something has got to give. “I was starting to realize that skating wasn’t what it seemed. I always thought of it as simply a sport. But with that sport came a lifestyle. And it wasn’t optional.” (262) Once she finds an alternative for this lifestyle in art, she is allowed to find a passion that ice skating had been lacking. Bright patches of yellow emphasize light sources and break up an otherwise monochromatic color scheme, with focus on faces except in cases where wide lens landscapes mimic the reflective internal narration and the emptiness that Tillie is feeling. But by the time I finished the story, I found myself in the same position as Tillie. Why did I continue? While yes there is the revelation at the end that she finally builds enough courage to quit a sport, it’s quickly over and is hardly the climatic finish were were hoping for. “How easy it was. I couldn’t help but wonder why I hadn’t done this sooner. But I didn’t have an answer. Even now, I’m still not sure. [… After the last lesson] I cried whole way home with my eyes wide open.” (362-370) After the monotony of skating, I would have liked to see her evolution post-skating, especially the development of her artistic aspirations. While I connected with her feelings of loneliness, it was difficult to connect with her when skating was such a major part of her little character development. Traumatic events are alluded to but never elaborated, and I feel like she is still holding herself back from connecting with readers. A contemplative collection of nostalgic considerations, possibly best suited for when you are facing your own moody state of stagnation. Many of you have probably been saying, “But doesn’t everyone have electricity?” It’s true that most people in Europe and America are lucky to have lights whenever they want them, plus things like air-conditioning and microwave ovens. But in Africa, we’re not so lucky. In fact, only about eight percent of Malawians have electricity in their homes, and most of them live in the city. Not having electricity meant that I couldn’t do anything at night. I couldn’t read or finish my radio repairs. I couldn’t do my homework or study for school. No watching television. It also meant that when I walked outside to the toilet, I couldn’t see the big spiders or roaches that liked to play in the latrine at night. I only felt them crunch under my bare feet. William Kamkwamba was born into a family of six sisters, located in a tiny village in the heart of the African country of Malawi.He spent his time studying for school, helping his family maintain their farm, and fixing radios in his spare time. When he was 13, tragedy struck as a drought swept the country, and with it extreme shortages of food and starvation. With no money for school and no crops to tend at the farm, William started spending time at the library. It was there he discovered the power of windmills, and the idea that a windmill could pump water from the well, fertilize their crops, and provide them with free electricity. He spent the next year teaching himself and collecting and buying scrap metal, including a rusty bicycle, a tractor fan, and a shock absorber. But would a teenager who barely passed middle school be able to design and assemble these pieces and parts together and make something? This is an uplifting true story about the power of engineering, ingenuity, curiosity, and perseverance. William didn’t know about electricity when he first started taking apart and putting back together radios, but he wasn’t afraid to learn. After dropping out of school due to lack of funds, William tries valiantly to stay on top of his studies so he can rejoin the class next year. He copies his friend’s notes and visits the library often, which he describes in great detail. I can picture the dusty shelves stuffed haphazardly with books that libraries here in America probably discarded because they were out of date or didn’t have colored pictures, but their information is still relevant enough to get William the information he needs. Anything he can’t find he’s willing to work to acquire. He pleads with this father to have the broken family bicycle. In order to pay for the services of a welder, he stacks firewood for hours to get enough money. When he needed washers, he collected bottle caps, pounded them flat, and hammered a hole into the center. It’s inspiring to think that this young man who so many would see as disadvantaged could do something so extraordinary that it would capture the public’s attention.While the book includes color photographs of his family and invention, it would have been nice and more enlightening if the book had included diagrams of his innovation. The descriptions are very detailed and paired with a picture you get an idea, but for children wanting to duplicate his efforts they may need to mimic his methods and do some more research. William’s family is disadvantaged, and he recognizes it, but it doesn’t impact his happiness. He doesn’t complain about using the latrine or lacking running water or electricity, only bringing up these details to better explain his situation, not try to excuse it. Overall he has a relatively happy life, with friends and games and free time to pursue his passion, even if that happens to be electrical engineering. In American he’d probably be playing with Lego Mindstorms instead of old radios. It’s important for readers, especially here in the United States, to understand his circumstances and the uniqueness of his accomplishment, and that he had to improvise with what he had instead of purchasing something he needed. The scenes of famine are heart-wrenching, but not sensationalized, and I think every reader will grow teary-eyed at the matter-of-fact telling of the situation with his dog and the medical maladies that fall on William and his friends. It’s one thing to say that African nations are poor or undeveloped or suffering from a famine, but it’s quite different to read about it through the eyes of a child who experienced it and brings those feelings to life. Rather than stay in American after college, it’s also unique to see that William wants to return to his country and work on projects for Africa, in Africa, and run by Africans. He doesn’t disparage his country or community, and wants to help it thrive by building on what is there, instead of changing it culturally or Americanizing it. Ending this blog post in the same way Kamkwamba ends his autobiography, hopefully his story will inspire others. Publisher/Date: Roaring Book Press, a division of Holtzbrinck Publishing Holdings Limited Partnership, c2015. In 1959, Berry Gordy secured an eight hundred dollar loan from his family to begin his dream, the music company Motown. Motown became known by its nickname Hitsville, as the production company put out hit after hit from big name, local talent like Marvin Gaye, Stevie Wonder, Smokey Robinson, and Diana Ross. For slightly over a decade, Berry Gordy and his company, who were treated more like family, were behind some of the biggest hits in pop and R&B. But when Gordy moved to California to expand the company, the music lost its rhythm, and artists started pursuing other opportunities and other companies where they could garner the attention and money they felt they deserved. By the 1980s, only a few loyal artists were still garnering hits, and Gordy sold the company before the decade ended, as the era of Motown had already ended earlier. The narrator is “the Groove,” which takes on the personality of a smooth talking tour guide who has a vested interest in your enjoyment, entertainment, and well-being. It makes the remembrance of pivotal historical moments, like the Civil Rights movement and assassinations of Martin Luther King Jr. and Kennedy, more manageable, reassuring readers that it’s in the past and we lived through it while not deemphasizing the importance of the events. Sometimes we forget the narrator is even present, and other times that effort is stressed in multiple paragraphs that try to reestablish the road trip ambiance. Some readers may like it, while others might have preferred a more straightforward narration with less embellishment. Little details, like the decorum and manners training that each artist received, break up the monotony of the presentation, which at times can read like a who’s who laundry list of best hits of the 1960s. There are hints of personality for some of the acts, especially when they are soloists instead of groups, but the groups almost become interchangeable, especially when they don’t have those back stories to distinguish them from the other groups presented. The recordings that were more political in nature, such as MLK’s speeches and the concept album featuring songs about the Vietnam War, were unknown to me, and I wish Pinkney had focused more on the aftermath of those publications, or the dissent in the group prior to publication. I feel like that is important to set the tone, and readers just received a minimalist view of the dissension caused by anti-war cover album, especially considering Marvin Gaye was Berry Gordy’s brother-in-law. Copious amounts of photos help delineate the different groups, but they are primarily staged publicity shots and very few show either the inside workings of the company or the community and culture that would have provided context. There is one page in particular that would have done well for thorough editing. When introducing the Primettes, soon to be known as the Supremes, Pinkney identifies the women pictured as “Betty McGlown, Diane Ross, Mary Willson, and Florence Ballard” in both a caption and in the text on page 94. On page 95, “Barbara Martin left to have a baby, so the newly formed quartet was down to three singers.” Further research on my part leads me to conclude that both women were only temporarily involved in the group, so maybe it’s not really an error, but I wish the discrepancy wasn’t there. We also are presented with a picture of the Temptations with new member David Ruffin before his replacement of original member Elbridge “Al” Bryant is discussed in the narrative. Minor mistakes, granted, but it leads to a feeling of sloppy editing. Another missed opportunity is consulting first hand-account source material. The detailed source notes pages are much appreciated, but it’s rare that a listed source is from that time period directly, with most of the sources being commentary or biographies published decades after events occurred. Part of the difficulty Pinkney faces is making the subject matter important to children, as most of them are only familiar with Motown music as being the old songs that their parents (or maybe even at this point their grandparents!) listened to. While I’m a fan of the “oldies” because my father played them for me, I think most readers are going to be more familiar with Taylor Swift, One Direction, and Adelle, just to name a few. If they are already familiar with the subject, great, but I don’t think they’ll be running to pick this one off the shelves, even with the great appealing cover and the local connection to Motown as I work at a Michigan library. I understand the difficulties this would have added to the production, but I feel it would have benefited greatly from the inclusion of a CD with at least a sampling of the songs discussed in the book. Publisher: Houghton Mifflin Harcourt, c2015. Published to coincide with the 10th anniversary of Hurricane Katrina, this slim volume starts before the storm and continues its coverage of the storm through the immediate aftermath.With a critical eye towards the efforts of various governments and agencies to react, he draws from multiple sources to use the words of those immediately affected by the disaster. While the city is still attempting to rebuild, and will probably continue their efforts into the foreseeable future, it’s an eye-opening account aimed at children who weren’t even alive when it happened. Don Brown’s illustrations (which I’m told on the copyright page are “pen and ink with digital paint”) are the most affecting part of this story. Brown wisely lets the pictures tell most of the story. The double paged spread (which is divided into two panels so as to avoid loosing any of it in the bleed) on pages 30-31 is just one example. Simply narrated with “People fight the flood. Some succeed. Others do not.” readers’ eyes are arrested by the single body sinking under the water as others struggle for gasping breaths and rooftop rescuers struggle to pull them to safety. An earlier set of four panels, vertically stacked, show flip-book style a wave crashing into the town of Buras, Louisiana, with only the water tower remaining. You see the pictures and the devastation before being reassured that, in this case, “The townspeople have all evacuate and no one dies.” Those are just two of many examples of the arresting artwork and well-placed text blocks. The cover is stamped that a “Portion of the proceeds from this book has been donated to New Orleans Area Habitat for Humanity.” Hopefully the funds will be put to good use. Pair with the earlier reviewed Finding Someplace, as many of that main character’s fictionalized experiences are detailed in this emotionally moving graphic novel. Highly recommended. Publisher/Date: Schwartz & Wade Books, an imprint of Random House Children’s Books, a division of Random House LLC, a Penguin Random House Company, c2014. There was no return for Tsar Nicholas II of Russia. 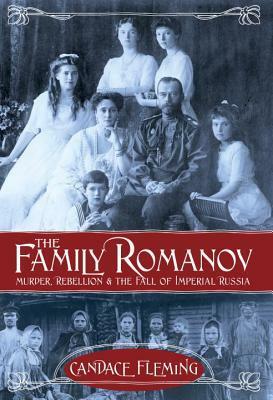 For years the Russian nobility had turned a blind eye to the crippling poverty overwhelming the populace. Instead of consulting with his advisers, he relied heavily on the advice of his wife, Empress Alexandra, a foreigner who married him under the dark mourning cloud of the former emperor’s death. She in turn was driven by “a deep belief in the miraculous and mystical” and consulted a questionable character named Rasputin, who was also looked upon with suspicion by everyone except the royal family (28). It didn’t help that the heirs were isolated, and the only son’s illness was kept a secret. Breeding suspicion and discontent among the famine, frustration, and fear of the first World War, those feelings soon followed the royal family into hiding, but the worst was yet to come. Anyone who has seen the movie Anastasia is at least partly familiar with the story of the last Russian Tsar and his family. I had the refrain of “Rumor in St. Petersburg” stuck in my brain through most of my reading. Most people probably never realized how inaccurate the plot of the movie was to history. As always, Fleming’s research is thorough, quoting extensively from the diaries and correspondence that have been miraculously saved for all these years. The details were surprising, including first hand accounts of what happened when the murders took place and a photograph of the room where the deed took place. It’s an intentionally disheartening read, almost like when reading about the Titanic, because history tells you that this is not going to end well for the family. I found myself shaking my head in amazement that Tsar Nicholas II could be so out of touch and purposely naive regarding his responsibilities, to the point where he stopped opening telegrams from his advisers and took the word of his wife over his generals. Probably the best decision that Fleming made was to include the final chapter regarding life after the Tsar, the rumors of survival, and the final nail on the coffin so to speak when the bodies were revealed, 25 years after their initial discovery. A fascinating read, this one will intrigue and inform. 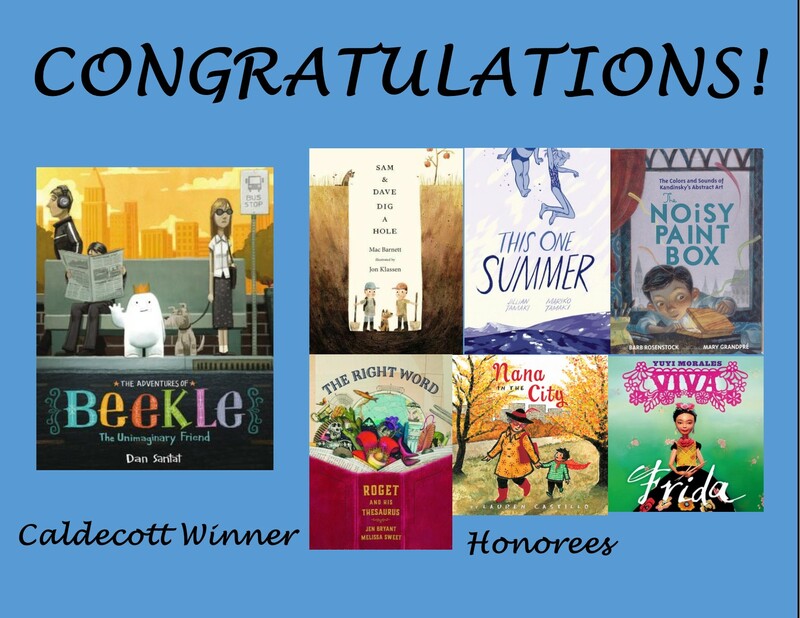 The ALA Media Awards were announced today. 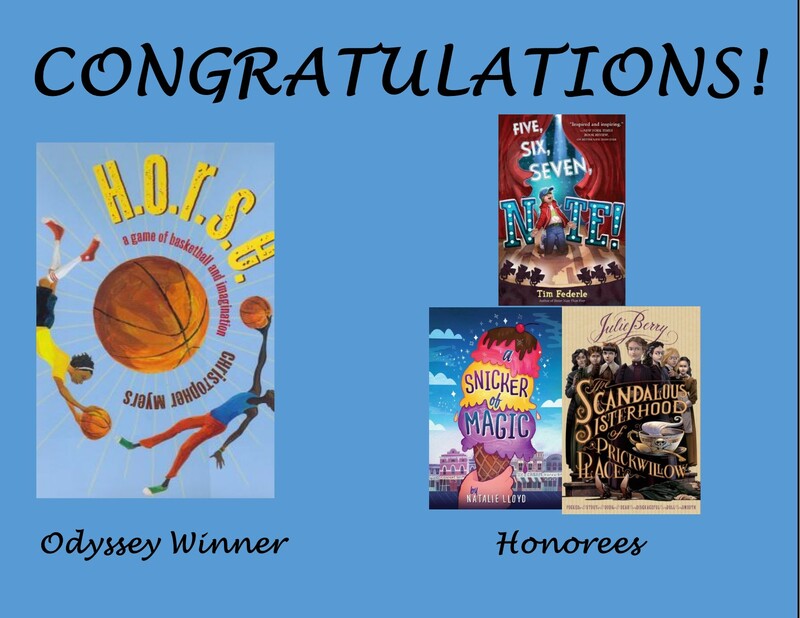 The Oscars of the children’s and teen literature world, here’s a break down of some the winners. The complete list can also be found on their website. I hesitate to include all of them because this post would be way too long, but these are the ones I think the majority of the readers have heard of and are interested in learning. 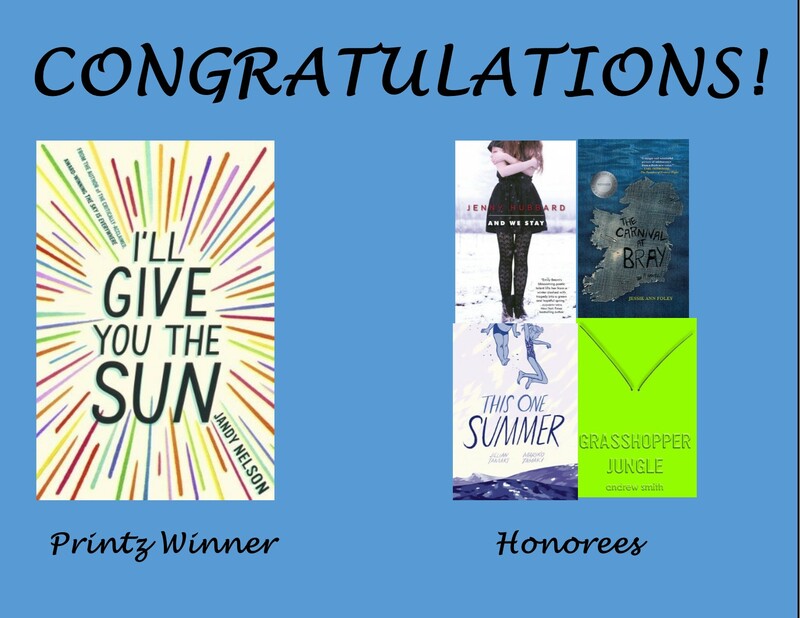 But please do check the website, as all of the winners should be considered and I may include the winners of the other awards in a future post. 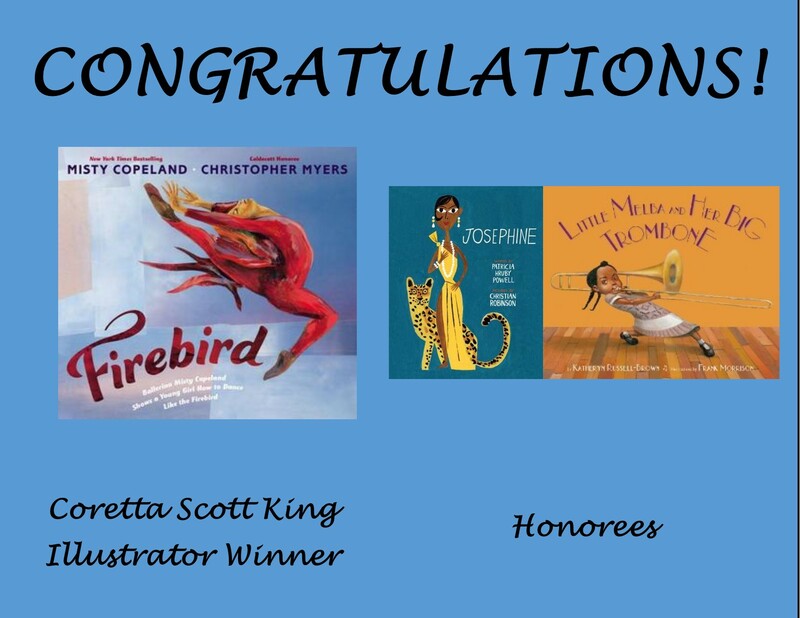 I had a weird since of coincidence as well when viewing the winners of the Coretta Scott King Illustrator Award. I give you the trio of biographies on female African American artists. 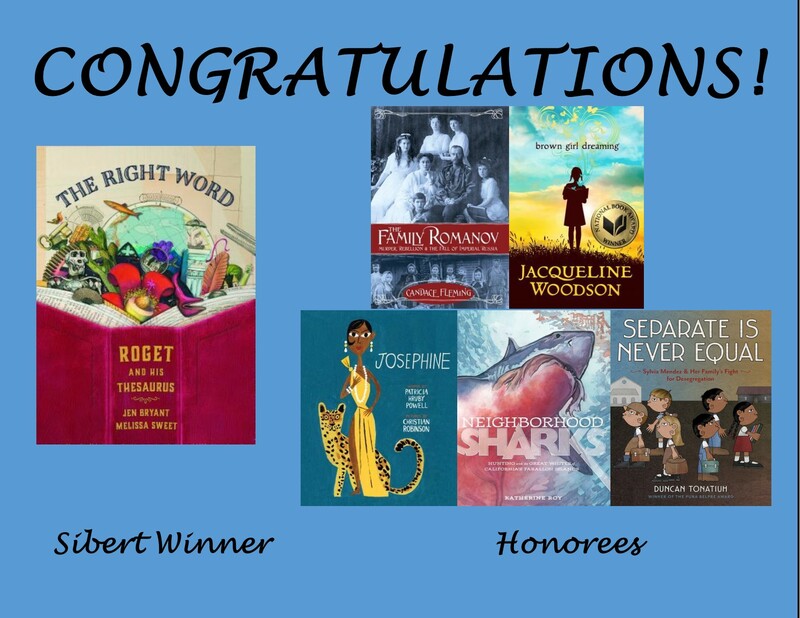 You’ll see some repeats from the above list to this next list as we move to the Robert F. Sibert Informational Book Award for most distinguished informational book for children. SIX Honorees! 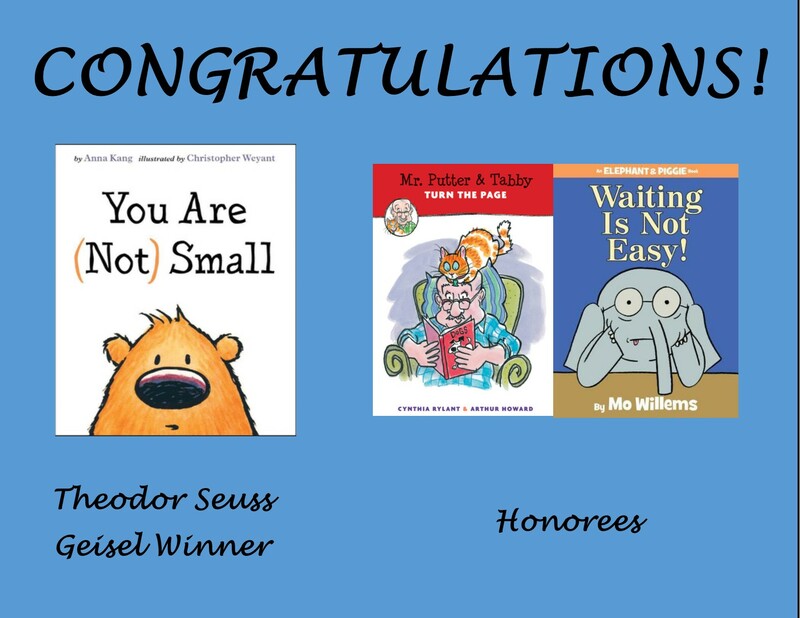 Three picture book biographies! And the most shocking inclusion of all, is a young adult graphic novel!! 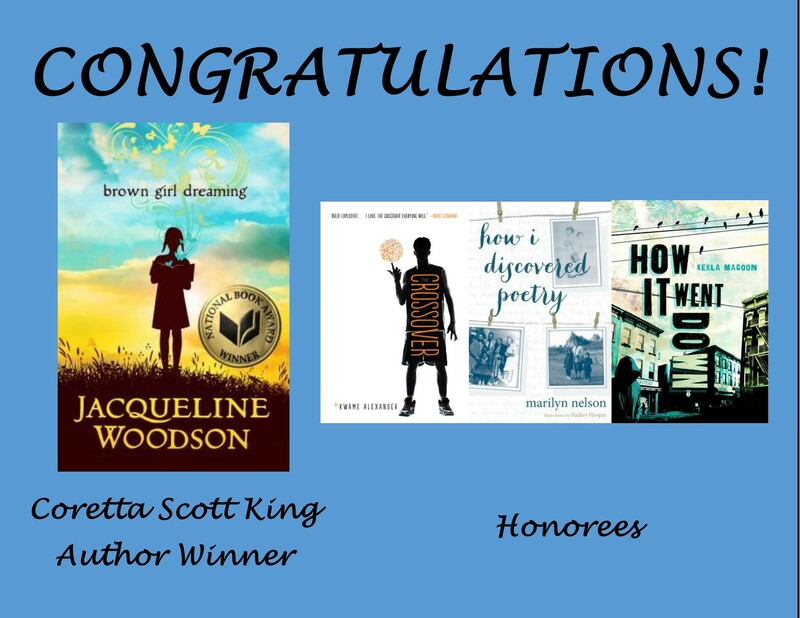 While I applaud the diversity of the selections and the number of honorees is unprecedented (can anyone prove otherwise), I’m disconcerted at the range of ages that the selections are intended for. I need to gather my thoughts and reread the book before addressing this fully, so stay tuned. 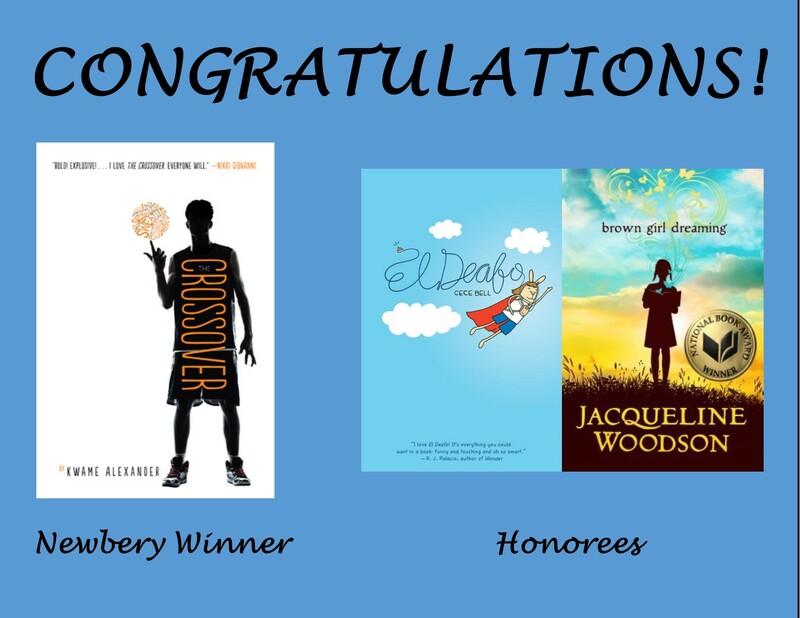 What award or winner most surprised you? Segregation in the 1960s was a violent time of upheaval. Most of us have heard the most familiar stories of Martin Luther King Jr. and Rosa Parks. But very few people may realize the effect that children and teens had in moving segregation efforts forward. During the entire month of April, 1963, the first in an effort to fill the jails and bring attention to the cause, only 123 people were arrested. But then a rallying cry and concentrated effort was made to enlist teenagers to a cause that would directly affect them. “Between Thursday, May 2, and Monday, May 6, almost 2,500 young people had been arrested.” (114) The treatment of these individuals, some as young as nine-years old, who flooded the streets brought national attention to events in the south. Ultimately, four children died in a church bombing that was the culmination of tensions between the black and white populations. Cynthia Levinson spent four years tracking down and interviewing these participants and researching how history played out almost 50 years ago. Including a map, a timeline, an index, pictures of those interviewed and an assortment of notes, this book is an amazing glimpse into a time that changed America. Levinson does a thorough job of bringing to life the actions of the teenagers but also those of the adults involved. 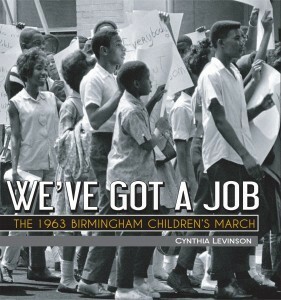 Readers finish the book with a solid understanding of how divided not only the community was on the issue of segregation, but also how disorganized the leadership was in achieving their goals. The government endorsed and encouraged the police’s prejudices against these protesters and it is hard to come to terms with their behavior based on today’s laws prohibiting such actions. At one point, government officials notified the Ku Klux Klan that they would be given 15 minutes to confront Freedom Riders, and the perpetrators who were caught after those violent fifteen minutes were given a minimal sentence. Pair this book with The Lions of Little Rock by Kristin Levine, which is set a few years earlier or The Rock and the River by Kekla Magoon and One Crazy Summer by Rita Williams-Garcia, which are both set a few years later. Especially in this unsteady time when unrest is reigning and emotions are high with so many political issues, including gay rights, immigration, and gun control, teens might take notes about nonviolent actions that they can use to affect change in today’s society. This post is in honor of Nonfiction Mondays. For the entire round-up of all the bloggers who participated, check out Anastasia Suen’s blog. This book in particular was read as I participate in YALSA’s 2013 Hub Reading Challenge which challenges readers to finish 25 books by June 22nd from a list of 83 titles that were recognized and published over the last year.